Toxoplasma gondii and Eimeria tenella are two common parasites in poultry. Mixed infections are likely to occur frequently in chickens due to the high prevalence of both pathogens. In this study, we investigate the co-occurrence of the two pathogens in the same immunocompetent host cell population towards potential parasite-parasite as well as altered patterns of parasite-host interactions. Primary macrophages from chicken blood were co-infected in vitro with T. gondii tachyzoites (RH strain) and E. tenella sporozoites (Houghton strain) for 72 h. Morphological observations by light microscopy and assessments of parasite replication by quantitative real-time PCR (qPCR) were performed at 24, 48 and 72 h post-infection (hpi). Six host cell immune factors previously linked to T. gondii or E. tenella infection were selected for gene expression analysis in this study. Distinct morphological changes of macrophages were observed during mixed infection at 24 hpi and immunological activation of host cells was obvious. Macrophage mRNA expression for iNOS at 48 hpi and for TNF-α at 72 hpi were significantly elevated after mixed infection. Distinct upregulation of IL-10 was also present during co-infection compared to Eimeria mono-infection at 48 and 72 hpi. At 72 hpi, the total number of macrophages as well as the number of both parasites decreased markedly. As measured by qPCR, E. tenella population tended to increase during T. gondii co-infection, while T. gondii replication was not distinctly altered. Mutual interactions of T. gondii and E. tenella were observed in the selected co-infection model. The interactions are supposed to be indirect considering the observed changes in host cell metabolism. This study would thus help understanding the course of co-infection in chickens that may be relevant in terms of veterinary and zoonotic considerations. Toxoplasma gondii and Eimeria tenella are two coccidian parasites in poultry. Toxoplasma gondii is a heteroxenous parasite and may inhabit a wide range of vertebrate species as intermediate host, which may harbor the cyst stages in various tissues  following tachyzoite replication. Several reports showed high seroprevalence of T. gondii in chickens worldwide [2–4]. In contrast, E. tenella is very host-specific and monoxenous, infecting particularly the caecal mucosa of chicken [5, 6]. Mixed infections are likely to occur in chickens, particularly under free-ranging conditions. Many studies investigate host-pathogen interactions of single T. gondii or Eimeria spp. infections [7–9], but little is known to date about the pathogen-pathogen-host cell interactions for simultaneous co-infections with species of these two parasite genera. Tachyzoites of T. gondii and merozoites of Eimeria differ in many features; however, asexual stages of these parasites share ultrastructural similarities [10, 11]. It was shown that transgenic E. tenella (Et-TgSAG1) may induce certain immunoprotection against T. gondii . On the other hand, T. gondii as a vaccine vector has a partially protective effect against coccidiosis . Mixed infections with T. gondii and Eimeria spp. were found in wild rabbits in a recent case report . The ability of T. gondii to suppress the macrophage-associated defense to Mycobacterium avium has been shown in vitro . Chicken macrophages are crucially involved in the host immune response to both T. gondii and E. tenella [2, 16, 17]. In coccidiosis, chicken macrophages are also involved in sporozoite transport during the endogenous phase of Eimeria development . Thus, it appears likely that simultaneous appearance of these two apicomplexan parasites may affect the reaction of host macrophages to parasite infection. Experimental in vivo studies revealed a partial mutual interaction between T. gondii and E. tenella  in chickens. Immune response of primary monocyte-derived macrophages is stimulated in vitro by T. gondii tachyzoites  and E. tenella sporozoites . High expression of pro-inflammatory Th1 cytokines is typically related to macrophage function in T. gondii infection . 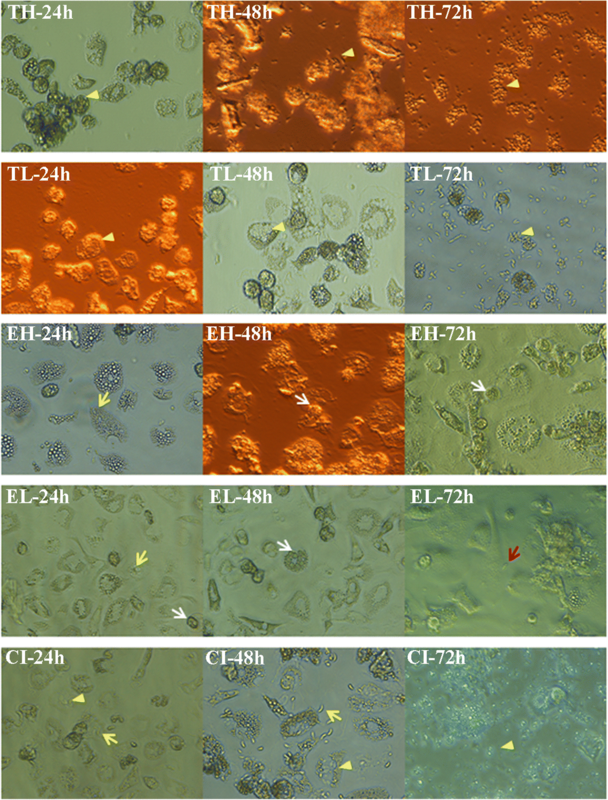 Previous investigations also showed that Th1/Th2 pro-inflammatory cytokines related to macrophages are involved in the host response to Eimeria infection [23–25]. High production of Th2 inflammatory mediators such as interleukin 6 (IL-6) was reported in T. gondii and E. tenella mono-infections [26, 27]. In vitro replication of T. gondii is enhanced significantly when murine macrophages are pre-treated with IL-6 prior to infection . In vitro infection of avian macrophages by E. tenella sporozoites upregulates nitric oxide (NO) production and inducible nitric oxide synthase (iNOS) transcription [29, 30]. Induced NO production by macrophages is generally related to cytokines such as IFN-γ and tumor necrosis factor α (TNF-α) which play a vital role in immunity of chicken against coccidiosis and toxoplasmosis [31, 32]. Various effects of in vivo co-infection of T. gondii and E. tenella in chickens  were observed on IFN-γ, TNF-α, IL-10 and IL-12. In this study, we aimed to understand the simultaneous co-occurrence of the two pathogens in the same avian immune-competent host cell population and the interaction with the innate immunity against each single pathogen. Additionally, pathogen-pathogen interactions in terms of invasion and replication potential were investigated. The ability of macrophages to host both parasites simultaneously is also demonstrated. Macrophages were separated and collected from chicken peripheral blood mononuclear cells (PBMC) according to established protocols . The isolated PBMC (5 × 106 cells per well) were suspended in RPMI-1640 medium (Sigma, Taufkirchen, Germany) supplemented with 5% chicken serum and 5% fetal bovine serum, penicillin (100 U/ml, PAA), streptomycin (0.1 mg/ml, PAA), and amphotericin B (0.0025 mg/ml, PAA), seeded into 24-well plates and incubated at 41 °C with 5 % CO2. They were grown to about 90% confluence within 96 h cultivation time. Free transgenic T. gondii RH-GFP tachyzoites (type I strain, kindly provided by Professor Dominique Soldati-Favre, University of Geneva Medical School, Switzerland) were harvested from infected human foreskin fibroblast (HFF) cultures by mechanical destruction. Eimeria. tenella Houghton strain (kindly provided by Professor Damer Blake, Royal Veterinary College, UK) and transgenic Houghton-YFP strain (kindly provided by Professor Xun Suo, China Agricultural University, China) sporozoites were gained by oocyst excystation following an established protocol . Briefly, the oocyst wall of E. tenella was destroyed mechanically with 0.5 mm glass beads (BioSpec Products, Bartlesville, OK, USA). Excystation of sporozoites was performed by incubation with 0.25% trypsin (w/v) (Carl Roth, Karlsruhe, Germany) and 4% sodium taurocholic acid (w/v) (Sigma-Aldrich, Taufkirchen, Germany) at 41 °C for 90 min. Purified sporozoites were collected by passage through columns of nylon wool and DE-52 resin (Whatman, GE Healthcare, USA) with 1% glucose phosphate-buffered saline (PBS) at pH 7.6 (follow buffer). E. tenella Houghton strain sporozoites were used for all experiments except for laser scanning analyses where E. tenella Houghton-YFP strain was utilized. Infection doses for both parasites were optimized prior to the co-infection trial (data not shown). Six groups were set-up for in vitro infection studies in primary macrophages: TH, T. gondii infection with 5 × 105 tachyzoites (high-dose); TL, T. gondii infection with 2.5 × 105 tachyzoites (low-dose); EH, E. tenella infection with 5 × 105 sporozoites (high-dose); EL, E. tenella infection with 2.5 × 105 sporozoites (low-dose); CI (co-infection), mixed infection with T. gondii 2.5 × 105 tachyzoites and E. tenella 2.5 × 105 sporozoites; NC, uninfected negative control cell cultures. At 96 h after isolation of PBMCs, purified primary macrophages were infected with parasites according to their group and incubated at 41 °C. At 12 hours post-infection (hpi), the wells were rinsed once with PBS to remove extracellular sporozoites. The medium was changed and cell cultures were further incubated at 41 °C. The course of infection was monitored until 72 hpi. In addition to the primary macrophages, Madin-Darby Bovine Kidney (MDBK) cell line cultures were used. In those cell cultures, six infection groups were formed (TH, TL, EH, EL, CI and NC) as described before. They were carried along in parallel to macrophage trials as controls for parasite replication analysis without macrophage-specific influence on parasite-parasite interaction. MDBK cultures were maintained and infected at 41 °C to enable comparison to primary chicken macrophage cultures under comparable incubation conditions. MDBK host cell cultures were tested before to be easily maintained and multiplied at this temperature (data not shown). Parasite replication was assessed by two parameters: microscopic examination over time and parasite-specific real-time quantitative PCR (qPCR). Morphological differences and parasite population densities were visualized in all groups at 2, 24, 48 and 72 hpi by light microscopy. For qPCR, samples from each group were collected at 24, 48 and 72 hpi. DNA extraction was carried out using the QIAamp DNA Mini Kit® (Qiagen, Hilden, Germany) according to the manufacturer’s protocol for cell cultures. The T. gondii-specific 529-bp repeat element was used to detect replication in a probe-based qPCR . Standard curve samples were generated by gradient 10-fold dilutions of 107 tachyzoites to obtain absolute DNA copy numbers for T. gondii amplification. Replication of E. tenella was measured by ITS1 fragment quantification in a SYBR Green-based PCR as described before . pSCA-17 plasmid standard dilutions were prepared as measure for the relative copy number of E. tenella DNA as described by Thabet et. al. . The qPCRs were carried out in a Stratagene MX3000P cycler (Stratagene, La Jolla, USA). The cycling program for T. gondii detection included 95 °C for 15 min (initial denaturation), followed by 40 cycles of 95 °C for 15 s (denaturation), 60 °C for 1 min (annealing), and 72 °C for 15 s (extension). The cycling program for E. tenella was performed as follows: 95 °C for 5 min (initial denaturation), followed by 40 cycles of 95 °C for 30 s (denaturation), 62 °C for 20 s (annealing), and 72 °C for 20 s (extension). For E. tenella, a subsequent melting curve analysis (95 °C for 1 min, 62 °C for 30 s and 95 °C for 30 s) was applied to create the dissociation curve and ensure amplicon consistency. Data represent the mean of three replicates with an acceptable standard deviation for Ct values of less than 0.5. In addition to light microscopy, CLSM (TCS-SP8, Leica, Bensheim, Germany) was applied to observe the morphology of the infected cell cultures, for localization of parasites within the host cells, and to estimate the extent of intracellular replication. Therefore, 2 × 106 PBMC per well were cultivated in 8-well chamber slides (Ibidi, Martinsried, Germany) for 4 days to grow pure cultures of primary macrophages. Infection conditions were the same as mentioned above for all infection groups (TH, TL, EH, EL, CI and NC). For CLSM, cultures were fixed with methanol for 10 min before further processing. 4', 6-diamidino-2-phenylindole (DAPI, Sigma-Aldrich, USA) was used to stain cell nuclei. Cell imaging was carried out by Leica Application Suite X (LAS X, Leica Microsystems, Wetzlar, Germany). Samples were collected at 24, 48 and 72 hpi, and stored at -80 °C. Six cell culture replicates per infection group were analyzed for each time point. RNA was extracted using the RNeasy® Mini Kit (Qiagen, Hilden, Germany) following the manufacturer’s instructions. Total RNA was measured using a NanoPhotometer NP80 (Implen, Munich, Germany). The complementary DNA (cDNA) was synthesized using the Revert-Aid® first strand cDNA synthesis kit (Thermo Fisher Scientific, Darmstadt, Germany), according to the manufacturer’s instructions. Briefly, 10 ng/μl total RNA were combined with 4 μl 5× reaction buffer, 1 μl RiboLock RNase Inhibitor (20U/μl), 2 μl 10mM dNTP Mix, 1 μl RevertAid M-MuLV RT (200U/μl), 1 μl of Oligo dT Primer (100 μM) and RNase-free water to a total volume of 20 μl. The mixture was incubated at 42 °C for 60 min and the reaction was terminated by heating at 70 °C for 5 min. The mRNA expression levels of chicken host cell cytokines were measured by reverse transcription quantitative PCR (RT-qPCR). Specific sequences of the primers for TNF-α, IL-6, IL-10, IL-12, IFN-γ and iNOS cDNA amplification were selected (Table 1). Data normalization was performed based on the two chicken cell housekeeping genes glyceraldehyde 3-phosphate dehydrogenase (GAPDH) and glucose-6-phosphate dehydrogenase (G6PDH) as described before . For qPCR assay, 10 μl SYBR Green master mix (Thermo Fisher Scientific, Germany), 6.6 μl water, 0.4 μl ROX solution, 2 μl cDNA template, 0.5 μl forward primer and 0.5 μl reverse primer were used per reaction. The cycling program included 95 °C for 10 min (initial denaturation), followed by 40 cycles of 95 °C for 30 s (denaturation), 60 °C for 30 s (annealing), and 72 °C for 1 min (extension). A subsequent melting curve program (95 °C for 1 min, 55 °C for 30 s and 95 °C for 30 s) was applied to create the dissociation curve for each PCR run. Relative parasite DNA copy numbers as derived from qPCR results were calculated and presented as mean value (n = 3) for each time point after infection. Cytokines were quantified from RT-qPCR results using qBase Plus 2.3 (Biogazelle NV, Belgium). Reference target stability and cytokine X-fold change differences between the infection groups were analyzed. X-fold change of cytokine expression was also calculated in comparison to the NC group data for each respective time point. Non-parametric Kolmogorov-Smirnov test was performed to test for normal distribution of data. Thereafter, the cytokine data were analysed statistically by ANOVA followed by Student’s t-test (SPSS version 20 ®, IBM, New York, USA). Data are presented as mean ± standard error of the mean (SEM). A P-value < 0.05 is considered as statistically significant. All infection groups were examined by light microscopy at four time points after infection (Fig. 1 and Table 2). At 2 hpi, invasion and adherence of E. tenella sporozoites were more obvious than for T. gondii tachyzoites in mono- and co-infected cell cultures (data not shown). Macrophage vacuolization occurred 24 hpi in the CI and Toxoplasma groups (TL and TH), but to a lesser extent in the Eimeria groups (EL and EH). Meanwhile, most of the E. tenella sporozoites remained in the intracellular sporozoite stage with low numbers of meronts appearing in both Eimeria-infected groups (EL and EH) and the CI group. At 48 hpi, many macrophages were detached in the infected cultures of TH group and CI group. There was a large number of free tachyzoites in the TH group with microscopic findings similar to 72 hpi in TL group and CI group. However, less free tachyzoites were visualized in TL and CI groups at 48 hpi. After 72 h, low numbers of E. tenella second generation of merozoites were found in the mono-infection groups EL and EH occasionally. By light microscopy, lowest numbers of macrophages were counted at 48 hpi. Almost no intact-appearing macrophage could be observed in T. gondii infection groups and co-infected group CI at 72 hpi. Findings were scored semiquantitatively (-, not observed; +, low amounts; ++, moderate amounts; +++, high amounts). Infection groups: TH, high-dose infection with T. gondii; TL, low-dose infection with T. gondii; EH, high-dose infection with E. tenella; EL, low-dose infection with E. tenella, CI co-infected group. In CLSM experiments using fluorescing transgenic parasites, it was observed that in co-infected macrophage cultures T. gondii partially replicated within host cells that also harbored E. tenella (Fig. 2a) from 24 hpi onwards. At 48 hpi, T. gondii meront numbers dominated over E. tenella meront numbers in the co-infected cell cultures of group CI (Fig. 2b). Host cell aggregation was seen in parallel with replication of T. gondii from 24 hpi. DNA copy quantities representing T. gondii tachyzoites and E. tenella (all stages) in all samples were measured by qPCR. The average parasite replication dynamics were different in mono-infected groups compared to the CI group for both parasites (Fig. 3). In mono-infected groups, qPCR results indicated that T. gondii was able to replicate considerably in infected chicken macrophages of groups TH and TL over the study period. In the TH group, a final decrease in T. gondii stage numbers was seen 72 h.
Both parasites could be demonstrated in infected MDBK monolayers. Generally, in co-infected MDBK cell populations, T. gondii parasite numbers were slightly higher in comparison to mono-infected cultures as assessed by qPCR. However, no significant difference between mono- and co-infection was observed for the replication of both parasites (data not shown). Compared to macrophages, the stage numbers of both parasites at 72 hpi were significantly different in MDBK cells (Fig. 4). Toxoplasma gondii tachyzoites were not able to replicate sustainably in the MDBK co-infected culture and were not demonstrable after 24 hpi. The number of T. gondii tachyzoites was significantly lower in all mono- and co-infected MDBK cultures compared to the population in similarly infected macrophage cell cultures throughout the infection period. Conversely, replication of E. tenella was approximately quadrupled in relation to the infection dose at 24 hpi in co-infected MDBK cultures. By light microscopic observation, infected MDBK host cells showed less morphological alterations than macrophages. Eimeria tenella merozoites were clearly observed at 72 hpi. The relative mRNA expression of six cytokines was measured until 72 hpi by qPCR (Fig. 5) and compared with the uninfected group NC as X-fold changes. From the investigated cytokine panel, only IL-6 did not show relevant alterations in any group at any time point. The measurement at 24 hpi showed a distinct elevation for iNOS and IFN-γ mRNA expression in EH and EL as well as CI groups (F(5, 31) = 4.81, P < 0.05 compared to NC group). In contrast, TNF-α was only slightly increased. For groups TH and TL, iNOS and IFN-γ were not significantly altered though TNF-α and IL-10 were slightly increased. Only in group EL, an observable increase in IL-12 expression was induced (F(4, 26) = 3.76, P < 0.05 compared to all other groups). No statistically significant differences were revealed between mono-infected groups and the CI group for IFN-γ, IL-10, IL-12 or TNF-α, respectively. At 48 hpi, IFN-γ mRNA expression was highest in group CI though group differences were not statistically significant. Significantly increased levels of IL-10 were observed in groups TH (F(4, 26) = 4.20, P = 0.020 compared to TL) and CI (F(4, 26) = 4.20, P = 0.025 compared to EL; F(4, 26) = 4.20, P = 0.105 compared to TH). IL-12 was highly expressed in groups EH, EL, and TH. In contrast, IL-12 mRNA expression was not elevated in group CI (F(4, 23) = 2.31, P = 0.026; F(4, 23) = 2.31, P = 0.029 compared to EL and TH). Expression of iNOS mRNA peaked in group CI at 48 hpi (F(4, 26) = 2.32, P = 0.006 compared to EL). TNF-α was not altered significantly by any infection mode until 48 hpi (F(4, 24) = 0.656, P > 0.05 for all group comparisons). At 72 hpi, IFN-γ mRNA expression levels were significantly increased for group EL (F(4, 24) = 1.64, P = 0.021 compared to EH). IL-10 expression was higher in groups TH and CI (F(4, 24) = 1.20, P < 0.05 compared to EH and EL). IL-12 expression was upregulated in all infected groups except for TL to a 2-fold to 3-fold extent. A moderate upregulation of iNOS as well as TNF-α expression were seen in all T. gondii-infected groups TH, TL and CI. Investigations into physiological alterations associated with experimental infections with mixed Eimeria spp. in chickens were previously published [39, 40]. However, to the best of our knowledge, there is only one published study of Eimeria spp. co-infection with T. gondii , probably because of the widely assumed sub-clinical character of toxoplasmosis in chickens . The lack in primary clinical presentation does not necessarily imply that T. gondii infections may not influence the course of other infectious diseases in chickens. Since both pathogens, Eimeria spp. and T. gondii, are widely distributed in chicken flocks [4, 6, 41], this study focused on their potential interactions on the avian innate immune cells using primary macrophages as a model. Although the single published in vivo co-infection study of T. gondii and E. tenella did not demonstrate major mutual interaction in terms of inflammation and pathological findings, a significantly lower E. tenella oocyst excretion was observed in the co-infection group compared to Eimeria mono-infection group . In the present in vitro T. gondii and E. tenella co-infection study, we found that there were various mutual effects between those parasites in chicken primary macrophages. 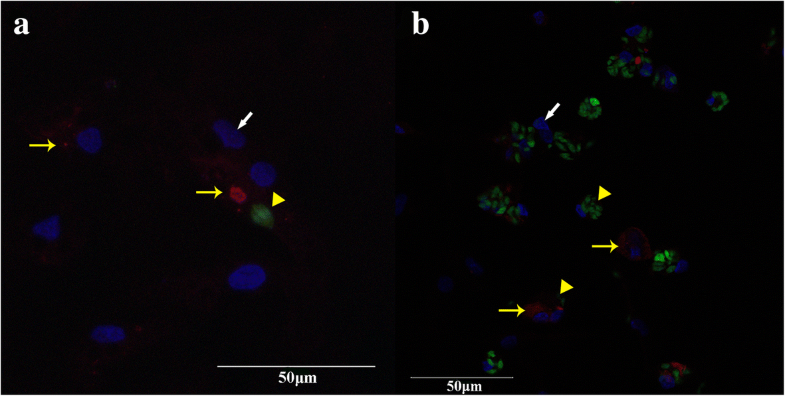 It was previously shown that chicken macrophages isolated from peritoneal exudates are capable of E. tenella sporozoite phagocytosis at 2–3 hpi . There are convincing evidences that the clinical course and lethality of E. tenella infection were reduced by activated macrophages [43, 44]. On the other hand, sporozoites of Eimeria utilize chicken macrophages as transport cells , and tachyzoites of T. gondii can multiply in chicken primary macrophages [33, 45]. In the present study, we established a PBMC-derived macrophage culture for successful replication of both E. tenella and T. gondii. In general, T. gondii seemed to be better adapted to replication within chicken macrophages; however, E. tenella stages multiplied as well. As expected, both low-dose mono-infected groups EL and TL showed a slower and more sustainable increase in parasite numbers over time than the high-dose infected groups EH and TH. In a primary cell culture with a limited availability of host cells, it seems plausible that a high infection dose destroys host cells faster; thus rapidly hampering parasites replication than a low initial number of parasites. Although E. tenella showed an initial decrease in total gene copy numbers, this was followed by a distinct increase in co-infected cultures only. This may reflect that T. gondii supports E. tenella replication in macrophages; however, this hypothesis needs further investigation. Mixed Eimeria spp. infections in vivo did not exert mutual effects on replication of three poultry Eimeria species . In contrast, in our in vitro model we found that E. tenella and T. gondii displayed interactions that were most pronounced towards the end of the study (72 hpi). At this time, both T. gondii and E. tenella were replicating more strongly in co-infected cultures than in the mono-infected controls. This effect was particularly pronounced for E. tenella. However, the capability of E. tenella to invade macrophages was not influenced by co-infection with T. gondii. Light microscopic observations showed that first generation meronts were the dominating stages of E. tenella in all mono- and co-infected cultures. Unfortunately, the chosen co-infection model is not able to investigate a potential influence of T. gondii on sexual E. tenella development. It can be speculated that the increase in asexual E. tenella seen during co-infection might only be temporary and stage-related since another recent in vivo investigation in our laboratory showed that a significantly low number of E. tenella oocysts were excreted by chicken co-infected with T. gondii than following Eimeria mono-infections . In accord with our current findings, Hiob et al. stated that the number of meronts in the intestine was not significantly altered by co-infection so the inhibiting effect of T. gondii on chicken Eimeria might be rather linked to the sexual development, which is not described to take place in macrophages. The MDBK cell line was used to investigate growth and functions of T. gondii and E. tenella in vitro in various ways [47, 48]. Regardless of mono- or co-infection, we found that reproduction of T. gondii tachyzoites was broadly lower in MDBK cells than in chicken primary macrophages. In contrast to E. tenella, T. gondii replicated much more strongly in the macrophage culture. It appears possible that the cell metabolism of MDBK cells is altered at 41 °C, which is distinctly above the physiological bovine body temperature. However, no significant effect on parasite multiplication was found in co-infected MDBK cell cultures compared to primary chicken macrophages. This indicates an important role of the host cell type in induction or modulation of pathogen-pathogen interactions whereas the incubation temperature of 41 °C does not appear to play a major role in our model. Chicken macrophages serve as phagocytes and regulatory immune cells. They produce cytokines, induce cytokine production in other immune cells, and destroy protozoans directly as part of the innate immune response [49, 50]. Although chickens are considered to be important natural hosts for T. gondii  and the only host species for E. tenella , immunoregulatory mechanisms by avian primary macrophages during simultaneous T. gondii and E. tenella infections are not sufficiently elucidated. We could demonstrate that, besides affecting the parasite replication potential, primary macrophage cell cultures reacted in different ways to both parasites during mono- and co-infections. Macrophages are not the main source of IFN-γ but they are capable of IFN-γ expression . IFN-γ plays an important role in the replication inhibition of the two investigated parasites [53, 54]. Five other cytokines produced by macrophages were included in our investigation: Th2-supporting IL-6, Th1-supporting IL-12, IFN-γ-inhibiting IL-10, and innate immune response-related iNOS and TNF-α. This panel was chosen because earlier studies clearly indicated the importance of those cytokines in coccidial infections [31, 46]. Single infections with E. tenella evoked host immune response which led to significant expression of cytokines such as IL-10 and IFN-γ in the ceca . In vivo, it was demonstrated that mRNA expression of IFN-γ, IL-12 and IL-10 was distinctly upregulated in the ceca of chickens at the early stage of co-infection with T. gondii and Eimeria spp. . In addition, high expression of those cytokines was observed in chickens co-infected with E. tenella and Clostridium perfringens . Based on our observations in the co-infection model, using 12 hour intervals for cytokine expression measurements might be useful in the future to more comprehensively judge parasite-host cell interactions. However, we could observe several host cell reactions in this co-infected model. In the present study, IFN-γ mRNA levels were upregulated mainly due to E. tenella infection, whereas co-infection seemed to suppress this Th1-related cytokine. Similar findings were recorded for IL-12 mRNA expression. Thus, it can be assumed that the adaptive Th1 response is rather suppressed than triggered in co-infected macrophages compared to mono-infections. In a recent study , a significant upregulation at 2 hpi and slight downregulation of IL-12 at 24 hpi were observed in a chicken macrophage cell line infected with E. tenella merozoites, which was diminishing over time. In contrast, IL-12 was upregulated by the end of the observation period in group CI, which might be related to the development of E. tenella meronts. Interestingly, in contrast to the cited in vivo studies [19, 55], we did not observe a distinct increase in IL-12 mRNA expression in co-infected macrophages. Therefore, we assume that not macrophages but other immune cell populations are responsible for the previously observed in vivo increase of IL-12 expression. In chickens, IL-6 mRNA expression was not significantly affected. This indicates that Th2 stimulation by macrophage-derived IL-6 does not play a major role in this infection mode. IL-10 mRNA upregulation was observed mainly in T. gondii infection with a delayed peak in group CI that coincides with increased E. tenella replication. Since one of the multiple functions of IL-10 is the downregulation of IFN-γ expression, this corresponds clearly with the reduced transcription seen in CI. 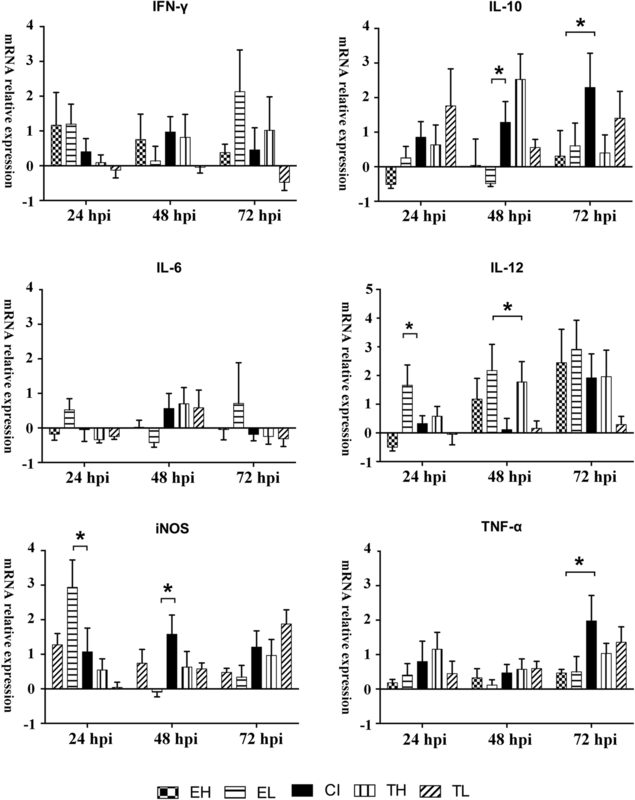 However, high expression of IL-10 in infected chickens is not associated to parasite multiplication or expression of cytokines like IFN-γ and IL-12 during T. gondii RH-infection . Thus, it seems as if in vivo multiple immune cell populations influence the Th1 response to apicomplexan parasites, with macrophages being an important part of the complex innate immune response. In spite of the relatively low IFN-γ levels in co-infected macrophages, reactive oxygen and nitrogen intermediates such as iNOS were produced in excess in these cells. This is interesting because IFN-γ is generally assumed to trigger the macrophages to produce these metabolites [31, 58]. It was previously [59, 60] demonstrated that T. gondii is altering NO production inhibition in chicken monocyte-derived macrophages and macrophage cell lines. In the present study, iNOS seemed to play a vital role in macrophage response during co-infection (Fig. 5). Conversely, it was reported that iNOS was distinctly expressed during E. tenella infection in vivo or ex vivo . This is in line with the general but moderate upregulation of iNOS mRNA expression in all infected groups seen in the present study. Furthermore, we observed increased TNF-α expression in all infected groups, and this was particularly distinct in T. gondii-infected groups reaching a maximum at 72 hpi in the co-infected group. TNF-α increase was described before in E. tenella-infected chicken macrophages [32, 61]. Other authors [62, 63] stated a synergistic anti-T. gondii effect of TNF-α and IFN-γ. Our study demonstrated that co-infection significantly upregulated TNF-α while parasite replication increased more than in mono-infected cultures. We conclude that TNF-α production may either not be sufficient to counteract parasite replication in our model, especially in the presence of low IFN-γ levels, as indicated by Chang et al. , or that TNF-α mRNA expression does not exactly reflect actual TNF-α levels. We demonstrated in vitro interactions between T. gondii and E. tenella in macrophages and MDBK cells. The findings of this study revealed that over a study period of 72 hpi, the replication of both parasites increased during co-infections compared to mono-infected cultures. Increased expression of IL-10 and TNF-ɑ in co-infected cells demonstrates that interaction of both parasites is tightly linked to the host cell types and their various responses to infection. However, the present study leads to further questions. Additional experiments are needed to fully clarify the signaling pathways that are, e.g. leading to replication differences between mono- and co-infected cells. The presented findings are currently based solely on in vitro experiments that were chosen because of the defined conditions that allow for a more precise initial data interpretation. Future in vivo studies taking into account the natural interactions between different immune cell populations are needed to confirm our findings and their biological relevance, as well as to enable a betterunderstanding of the mechanisms of host-parasite and parasite-parasite interactions during co-infections. Additionally, investigations into subsequent infections with both pathogens will be helpful to estimate the relevance of non-simultaneous infections with both parasites that might be most relevant in the field. We thank Johannes Kacza and all members of the Institute of Parasitology, University Leipzig, especially Tina Goroll and Irene Malkwitz, for technical assistance and support. This study is supported by a research doctoral fellowship to RZ granted by Akademie für Tiergesundheit (AfT) and Karl-Enigk-Stiftung (KES), Germany. The authors acknowledge support from the German Research Foundation (DFG) and Leipzig University within the programme of Open Access Publishing. RZ designed the study, wrote the manuscript and performed the experiments. AT participated in the collection of parasites and chicken blood. LH and WZ analyzed data and helped to draft the manuscript. AD and BB critically revised the study design, data interpretation and manuscript. All authors read and approved the final manuscript. The animal experiments related to the blood sampling were approved by the responsible authorities (Landesdirektion Sachsen, Germany, trial registration number V13/10).